Ceija was the fifth of six children born to Roman Catholic Gypsy parents. The Stojka's family wagon traveled with a caravan that spent winters in the Austrian capital of Vienna and summers in the Austrian countryside. The Stojkas belonged to a tribe of Gypsies called the Lowara Roma, who made their living as itinerant horse traders. 1933-39: Ceija grew up used to freedom, travel and hard work. Once, her father made her a skirt out of some material from a broken sunshade. She was 5 years old and her family's wagon was parked for the winter in a Vienna campground, when Germany annexed Austria in March 1938. The Germans ordered them to stay put. Her parents had to convert their wagon into a wooden house, and they had to learn how to cook with an oven instead of on an open fire. 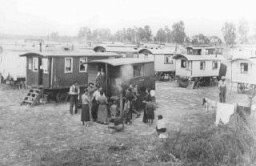 1940-44: Gypsies were forced to register as members of another "race." Their campground was fenced off and placed under police guard. Ceija was 8 when the Germans took her father away; a few months later, her mother received his ashes in a box. Next, the Germans took Ceija's sister, Kathi. Finally, they deported all of them to a Nazi camp for Gypsies in Birkenau. They lived in the shadows of a smoking crematorium, and they called the path in front of their barracks the "highway to hell" because it led to the gas chambers. Ceija was subsequently freed in the Bergen-Belsen camp in 1945. After the war, she documented and published Lowara Gypsy songs about the Holocaust.